The Taliban thought it had destroyed one of the world’s wonders, the monumental Buddha statues of the Bamiyan Valley. But the Buddhas shine again in the towering cutouts in the mountainside where they stood for centuries. They are back, thanks to 3-D light projection. And they look great. Built in the 6th century before Islam had traveled to the central Afghanistan region, the two Buddhas of Bamiyan were famous for their beauty, craftsmanship and of course, size. The taller of the two Buddhas stood at more than 170 feet high, with the second statue at nearly 115 feet. They were once the world’s largest standing Buddhas. In March 2001 Taliban leader Mullah Mohammed Omar ordered the Buddhas destroyed. They were subsequently blown apart and left in rubble. 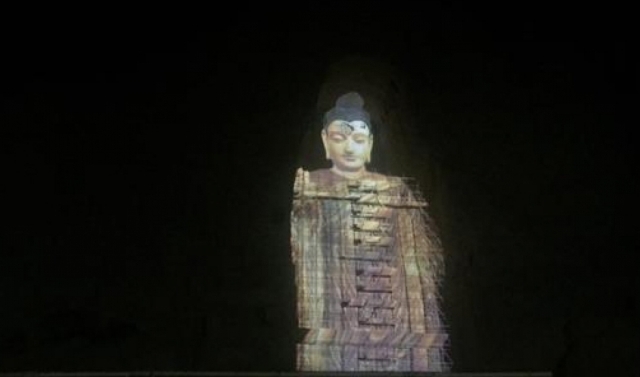 But the technology that gives us images of Tupac Shakur or Michael Jackson in concert, or Narendra Modi on the campaign trail, have been applied to the Bamiyan Buddhas. Now, 3-D light projects on the empty cliff where the statues once stood. The device that controls the illumination was a gift from a Chinese couple to the Afghan people. Many have called for the reconstruction of the statues, but UNESCO suggests rebuilding the massive stone Buddhas might be impossible. With the new light projection, the Bamiyan Valley might just have the next best thing. This article was republished from www.e-buddhism.com. You can find the original post here.